2 THE NEW CATALOG IS HERE!! Unlike some of our competitors, Lakewood Instruments does not have territory based distributors within the Continental US. This means that Water Treatment professionals and plant personal can get direct support from our factory for any questions they may have. It also means that we are not directing equipment inquiries to the local distributor to “sell around” our Water Treatment professional resellers. But this can leave a gap in the sales chain. While we ALWAYS tell an end-user that they should ask about buying Lakewood Equipment from the company currently servicing their account, that company may not offer or prefer Lakewood Instruments Equipment. That is why we came up with the PARTNERS PAGE and PARTNERS PROGRAM (Click “Where to buy” on the website). When an end-user calls Lakewood Instruments and asks “Where can I buy your equipment”, we direct them to the Partners Page. When they call us and ask “How do I find a Water Treater to talk about equipment and monthly services?”, we direct them to our website and the PARTNERS PAGE. We do this multiple times every day. So, who are our Partners? Well, they include larger Regional Water Treatment Companies and smaller one man shops. They are companies and individuals that answer equipment inquiries or applications by saying “We should go to a Lakewood controller”. They work with us on their applications and back that up with some throughput. They have done online and/or in person training on our products. We don’t set an impossible sales goal, but we (and you) know if you’re a partner when it comes to recommending and installing Lakewood Instruments products. What is the benefit of being a partner? There are two distinct benefits. 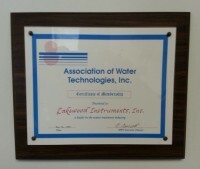 First, any equipment inquiry we send your way can be elevated into a new account for your Water Treatment services. Hand-deliver the equipment, do a site survey, use the contact and sale as an opportunity to meet a potentially new account. We may only be giving you an equipment sale equaling a few hundred dollars, but we are exposing you to an account that could be worth a few hundred thousand. The second benefit is becoming a member of our Partners Program rebate. If you are a Water Treatment Service Provider Partner, based in the US, and increase year over year sales (no matter what your size) by 10%…we give you a rebate credit of 5% of your total sales for that year to be used during the next year. That is free money for being successful and being loyal. If you are a Water Treatment Service company that starts the equipment conversation with “We’ll use a Lakewood” you should contact Paul (East) or Tom( West) to discuss what it takes to be added to our Partners Page. The Lakewood Instruments 2015 Catalog is released and available for Hard Copy order and PDF DOWNLOAD. All prices have been applicable since Jan 1st, 2015. All written quotes (previous year) are honored for 60 days except for the model 2000e series which has been replaced by the NexSys®. Every year, we try to create a cover about who we are. This year, the cover is about who we have been. For over 40 years, we have been providing equipment, innovation and advice to Water treatment Service providers across the country and around the world. We appreciate you support and trust. Are you and your organization receiving the benefits of the twice a year training provided by the AWT.org? The scope, depth and quality of the training done at the two locations is phenomenal. The combined expertise of the presenters and their knowledge of the subjects taught, as well as the materials presented, are a HUGE benefit to any new or “old hat” that attends. The presentations given, the facilities used, and the AWT staff support let each attendee focus on the training, allowing them to return to your organization with an elevated knowledge of treatment theory, the industry and its practices. If you have not attended in awhile, or are not sure if your organization would benefit, we suggest that you attend one of the trainings to evaluate the program. You will not regret it. We look forward to seeing you there! We are expanding our pump offering to include the Yamatho Series of Pumps. They are user friendly, reliable and easy to maintain. Analog dosing pump with constant flow rate and analog interface. (0÷20% – 0÷100%), Power-ON led indicator. PTFE diaphragm for extended operational life. Standard pump head in PVDF and ceramic check valve balls. Case made in PP reinforced with fiber glass. IP 65 rated. Complete standard installation kit composed of: PVDF foot filter and injection valve, 1/4″ PVC suction tube and 1/4″ PE discharge tube. To find out more about the specifications, performance, applications and cost of the Yamatho Pump, call our customer service. The Nexsys® System is being expanded AGAIN. This time, we have released the Boiler version. The 5.7″ COLOR touchscreen is user friendly and can be remotely mounted. The controller can control and monitor up to 4 Boilers, with probes and components as remote as 1300 feet away (400 meters). For more information, visit our NexSys® page or call us at 800.228.0839 to schedule a Demo/WEBinar with your team. I get many tech calls pertaining to older controllers that are “showing their age”. Customers have invested their money in controllers, and want them to last forever. We have many controllers in the field that were originally sold in the 70’s, 80’s, and 90’s that are still working correctly. We are proud that our products have lasted for so many years. When a controller fails, there is always the question, “repair or replace”. Sometimes a repair is the right answer if the controller is relatively new, and other components are in good working condition. The best thing to do is call us to do some troubleshooting to determine the cause of the failure. If needed, we will issue a repair authorization for you to send the controller to us for factory service. We will determine the repair cost after evaluating the controller, and notify you of your options. The Tech Service bench fee for evaluations and repairs is $100.00 per hour with a 30 minute minimum. When a repair is too costly compared to the cost of a new controller, we will tell you that. There are some instances where a repair would cost more than a replacement, such as the 1500 series. In other cases, repair parts are no longer available, such as the 100 series, 250, 260, and other older controllers. I always tell customers that I want them to spend their money with Lakewood, but I would much rather have them spend it wisely. My “Rule of Thumb” is that if the repair approaches 50% of the cost of a new controller, then a replacement is a much better solution. If you have a question about a possible repair, or need to do some troubleshooting, feel free to contact me directly at 800-228-0839, or csd@lakewoodinstruments.com. We are social networking all of the time. Come join us.